If you were zooming down a familiar street and suddenly saw a bunch of concrete steps floating in the street in front of you, would you hit the brakes? The strange sight would likely be enough to slow you down a bit, especially as your ‘driving brain’ perceives an obstacle and instinctively reacts. 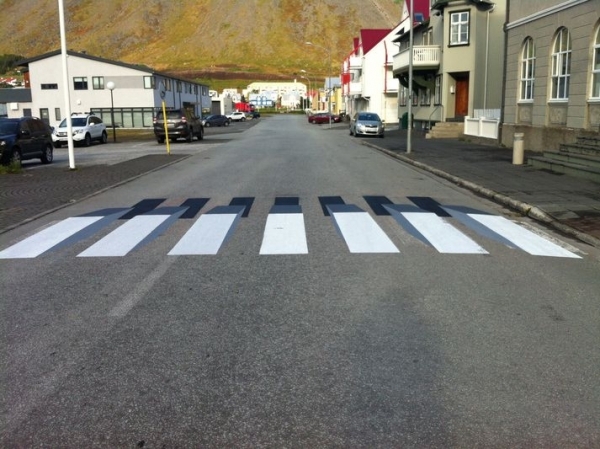 Officials in the small Icelandic fishing town of Ísafjörður are counting on it with their first 3D crosswalk, intended to reduce drivers’ speeds on the narrow street. Inspired by similar projects instituted in Russia, China and India, the crosswalk by road painting company Vegmálun GÍH is fully permitted, and street painters had to practice 3D painting a lot before they put it in place. 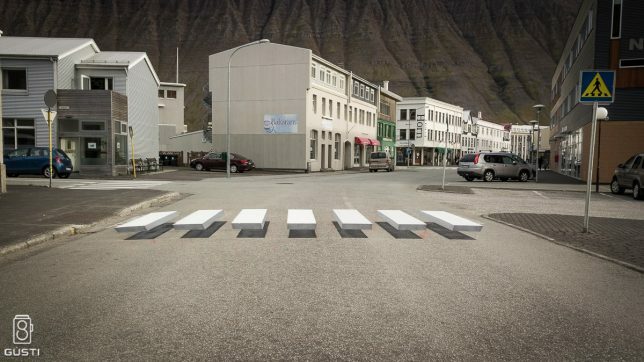 These ‘optical speed bumps’ not only encourage drivers to slow down (in theory), but also call attention to pedestrian crossing points, potentially making them a little safer. So, do illusions like these actually work? That’s debatable. In cities like Beijing, where traffic tends to be a chaotic free-for-all, officials say they’re helping, and that at the very least, they can keep pedestrians visually occupied until the light changes so they don’t jaywalk. Critics of the technique say local drivers will disregard the effect after the first time, which may be true, but at least it’ll garner a reaction from visitors.